This guide contains procedures to be performed by committers/maintainers of this codebase. to enhance JDO entities prior to running the app. 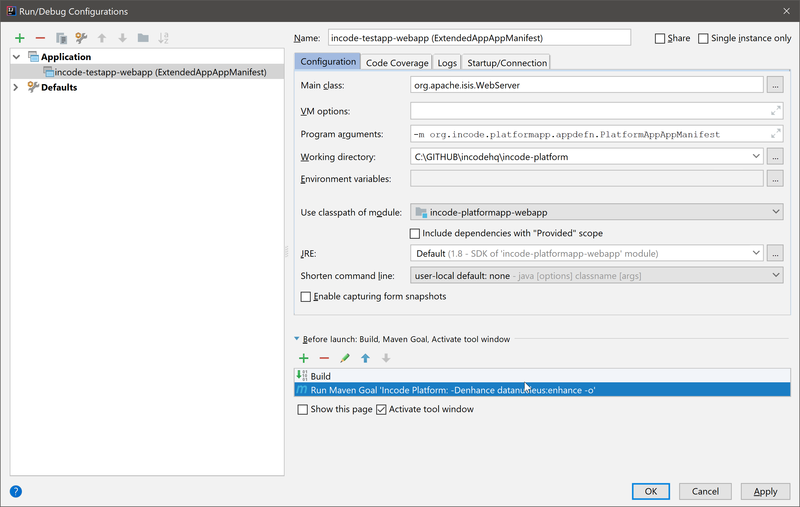 Integration tests for individual modules can be run from the IDE; each modules integration tests resides in its own Maven module. As noted in the home page, interim releases of the Incode Platform source are available at repo.incode.cloud. Pushing to this remote will trigger a CI build that will automatically upload a new release to repo.incode.cloud. The release process uses Sonatype’s OSS support (see the "producers" user guide and associated subdocuments). Our thanks to them for providing this service. Apply for access to release org.incode. Use OSSRH-28156 as a template. Also of interest might be the original requests for incode.org (OSSRH-18045 and isisaddons.org (OSSRH=10641). Full details of how to do this can be found in Sonatype’s working-with-pgp-signatures guide. 1 the version to be released. Generally speaking this should correspond to the version of Apache Isis. If necessary, update the incode-parent module (in modules/pom.xml), so that it references the correct version of Apache Isis. The quickstart archetype is re-created for each release from the current quickstart application. The generated archetype is then released by deploying up to Maven Central. Confirm that the parent pom.xml of the quickstart application inherits from the release version of org.incode:incode-parent. git commit -am "recreates archetype for $INCODE_REL"
deploy the archetype (using mvn deploy). Login using sven/pass. The application generated should be the Quickstart app. and republish (as described below). The website is published to the incodehq/incodehq.github.io github repository; a CNAME file (in the root directory) maps this to https://platform.catalog.org. Make sure that you’ve checked out the incodehq/incodehq.github.io repository alongside this one (see discussion above). The actual website generation uses AsciidoctorJ, which is called by Maven plugin. There are no other software prereqs. This builds the HTML and the search index, but omits building the PDFs. To enable you to preview the generated site, it starts a (python) webserver to browse. This will remove all files in the incodehq.github.io directory and replace with the latest build. (or use preview.sh to also generate the PDFs).